Franciosi was one of ten rising stars from Europe to receive the award from the European Film Promotion (EFP) at the Film Festival on Monday 11th February. 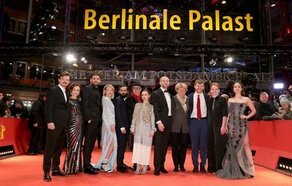 The European Shooting Stars 2019 were welcomed to the Berlinale Palast stage by US producer Martha de Laurentiis, producer of both Hannibal films and the Television adaptation to present the award. The talent programme is celebrating its 22nd edition and is financially supported by the Creative Europe - MEDIA Programme of the European Union and participating EFP member organisations. The ceremony was held in the presence of Festival Director Dieter Kosslick and Monika Grütters, German Federal Government Commissioner of Culture and the Media and a number of Europe's cultural ministers. In addition to the public exposure, the programme provides a special platform for the Stars to meet casting directors, producers and filmmakers in one-on-one meetings, offering a unique opportunity to create the personal contacts and networks needed to embark upon an international career. The European Shooting Stars 2019 are supported by the following EFP member organisations: Danish Film Institute, Estonian Film Institute, German Films, Icelandic Film Centre, Screen Ireland, Macedonian Film Agency, Norwegian Film Institute, Polish Film Institute, Film Center Serbia and Swedish Film Institute. Francisosi received the award alongside Dawid Ogrodnik (Poland), Kristin Thora Haraldsdóttir (Iceland), Milan Maric (Serbia), Ine Marie Wilmann (Norway), Ardalan Esmaili (Sweden), Emma Drogunova (Germany), Blagoj Veselinov (FYR of Macedonia), Elliott Crosset Hove (Denmark) and Rea Lest (Estonia). The recipients of the European Shooting Stars Award 2019 were selected by a panel of industry professionals including Irish producer Macdara Kelleher. Irish actress Aisling Franciosi, whose credits include TV series ‘Games of Thrones’ and ‘Legends’, is said to have stunned the jury with her "great acting range and superb instincts" in ‘The Nightingale’. Franciosi first appeared on screen in the BBC series, ‘The Fall’ for which she received the Irish Film and Television Award (IFTA) as Best Actress in a Supporting Role in 2015. She was cast in Ken Loach’s ‘Jimmy’s Hall’, which premiered at the Cannes Film Festival 2014, and most recently, she played the lead in ‘The Nightingale’ by Jennifer Kent, which won the Special Jury Prize at the Venice International Film Festival 2018. Franciosi was also honoured as one of Screen Daily’s prestigious “Stars of Tomorrow” in 2015. European Shooting Stars is the oldest and most prestigious initiative to promote European talent for the international film market. Since its first edition in 1998, a total of 303 European Shooting Stars have been presented at this influential international film festival, proving for many an important stepping stone in their careers, including Alicia Vikander, Matthias Schoenaerts, Domhnall Gleeson, Alexander Fehling, Ruth Negga, Pilou Asbæk, Carla Juri and Baltasar Kormákur to name a few. Franciosi stars in ‘The Nightingale’ which just released internationally at the end of January 2019.